Does anyone else wish their home was built to clean itself? Yeah, me too. Until then, the world is stuck trying to juggle careers with kids and a clean home. One thing that makes keeping your home clean extra-challenging is clutter. I was recently inspired by the short read, The Life-Changing Magic of Tidying Up: The Japanese Art of Decluttering and Organizing by Marie Kondo. 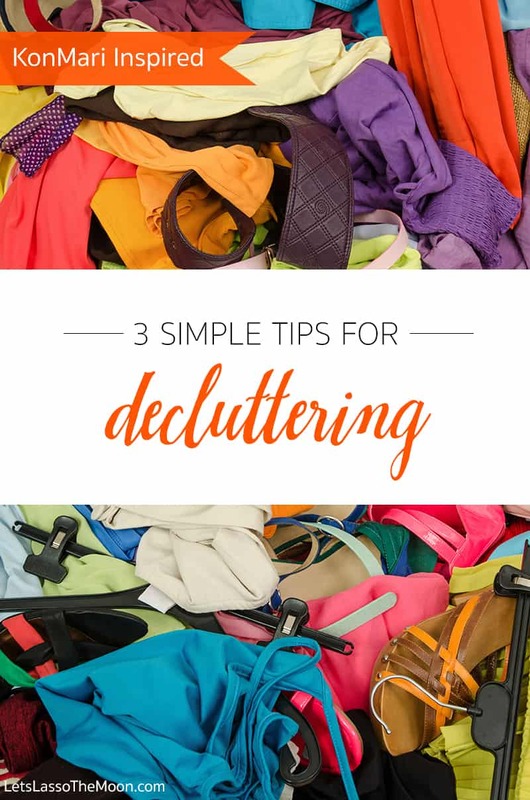 With a few of her suggestions, we may all be able to master the art of decluttering. Despite my journey toward modern minimalism, I’m often guilty of having way too much stuff. Aren’t we all? This tip is so simple and yet so challenging: Keep only what you need. Honestly, do you need 2 sets of China or 20 pairs of shoes? Now is the perfect time to get rid of what you don’t need and only keep the essentials. I promise, it will feel great to have that unused stuff out of the house. I love how in the book she doesn’t just say “organize”; she says organize to save space. She explains, people of Japan keep their tiny apartments organized so they can have a daily functional life without being overwhelmed by clutter. Think about it—what are some ways you can stay organized and still save space? If you’re not going to use it, get rid of it. I’m so guilty of this, I’m a hanger-freak. I love to hang up clothes and I feel as though they’re organized that way. Kondo says, no way! 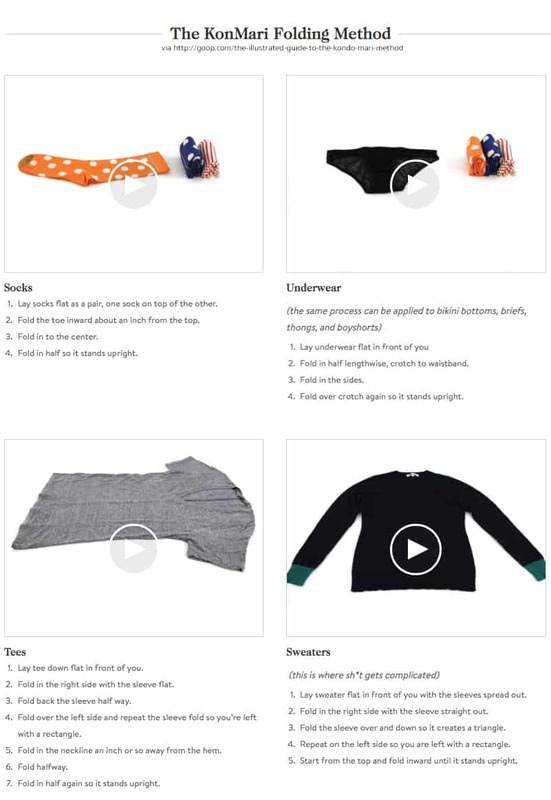 She says that folding your clothes—using her special technique—is the best way to organize clothes. Be sure to pop over to the website goop to watch these awesome animations. You already have 10 sweaters, what’s one more? Kondo explains that just because Americans have more space and more stuff, it doesn’t mean they are happier. I admit, she’s got a strong point. I also think a lot of reasons people hold onto stuff is that they feel emotional about it. For example, I had a business suit that had been sitting in my closet for years. I wore it to many meetings before leaving the office to have children. The truth is, even if I was to ever head back to the traditional workplace, I’d never wear that suit. It wouldn’t fit and it would be out of style. Letting go of that suit was hard because it symbolized a specific part of my life. After reading this book, I finally had the courage to just put it in the Goodwill pile. Kondo suggests holding an item and thanking it for its service before donating it. It sounds kind of cheesy, but I swear it helped me let go of a lot of emotional things! 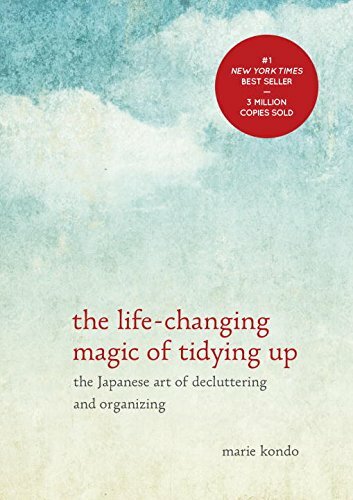 Condo’s book The Life-Changing Magic of Tidying Up: The Japanese Art of Decluttering and Organizing is a must-read. I’m telling you, getting rid of clutter is good for the soul. 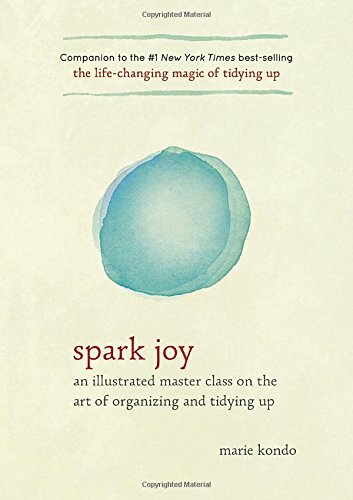 I can’t wait to read her latest book, Spark Joy: An Illustrated Master Class on the Art of Organizing and Tidying Up. I’ll be sure to let you know if I find it equally inspiring. If you’ve already read it, I’d love to hear your thoughts in the comments below. P.S. Want to get started on decluttering RIGHT NOW? 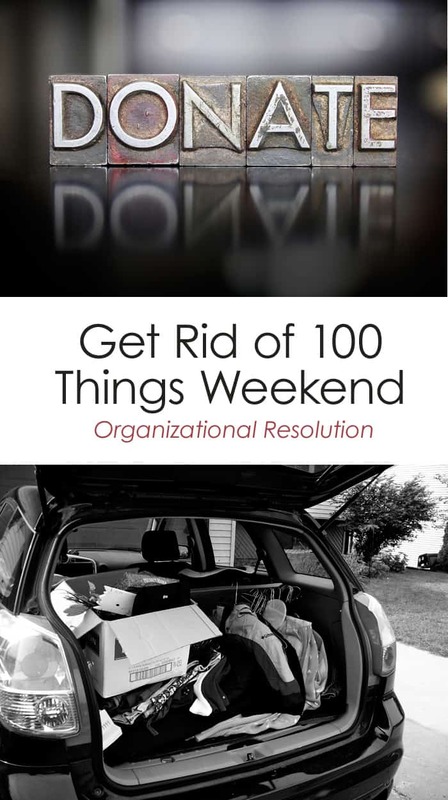 Kickstart with this family project: Get rid of 100 things this weekend. You’ll be on your way to full decluttering bliss in no time.